With our firm commitment to stand tall on the expectations of our esteemed clients, we are engaged in manufacturing and supplying a wide assortment of Automatic Capsule Sorter. Moreover, we borrow essential raw material from the trusted source only. All more positive initiatives in this regard have promoted our organization as a very prestigious one and our products are highly appreciated in the market. We are amongst the leading manufacturer and supplier of Automatic Capsule Sorter.Our products are fabricated using the high-grade raw material, which we procure from trusted vendors in the market. It is designed to sort out lose caps & diametrically filled capsules. 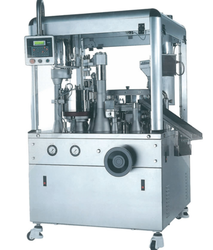 The machine can be coupled to an automatic filling machine. We are the leading manufacturer of Auto Capsule Machine Raceway and our product is made of good quality.